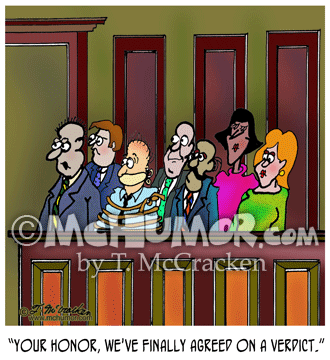 Jury Cartoon 5494: Foreman of jury saying, "Your Honor, we've finally agreed on a verdict." 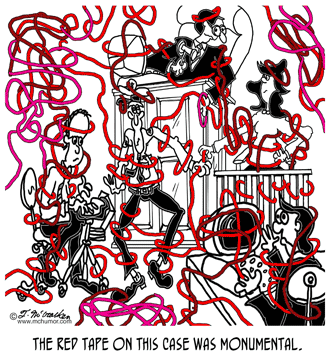 One of the jurors is bound and gagged. 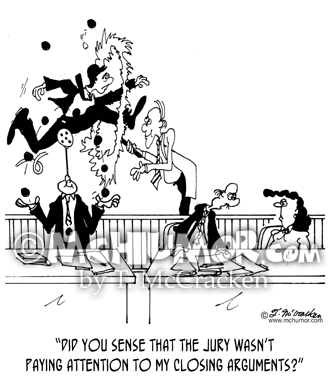 Law Cartoon 5314: A lawyer, not seeing opposing council juggling, says to his partner, "Did you sense that the jury wasn't paying attention to my closing arguments?" 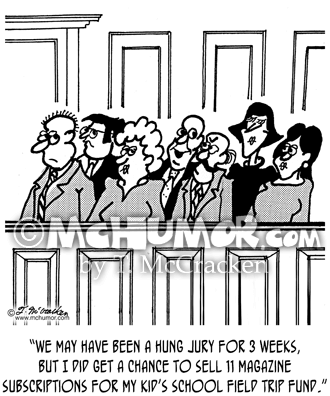 Jury Cartoon 4657: People in a courtroom crawl over one another. 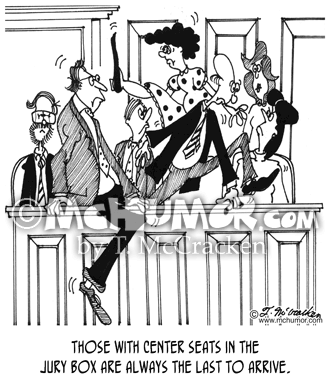 "Those with center seats in the jury box are always the last to arrive." 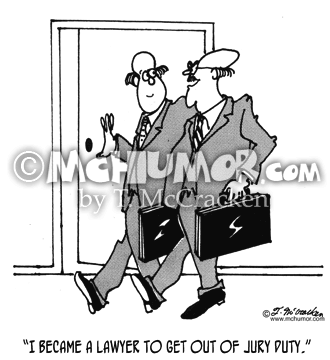 Jury Cartoon 5492: A lawyer saying to another, "I became a lawyer to get out of jury duty." 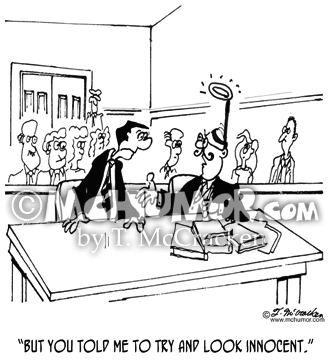 Lawyer Cartoon 5299: Man with fake halo on head says to his lawyer, "But you told me to try and look innocent." 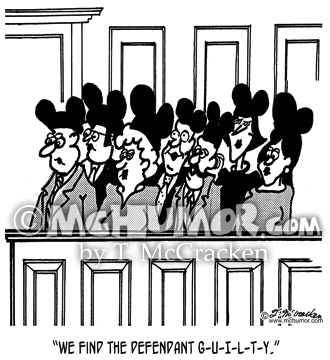 Jury Cartoon 4589: Jurors wearing Mickey Mouse ears all say, "We find the defendant G-U-I-L-T-Y." 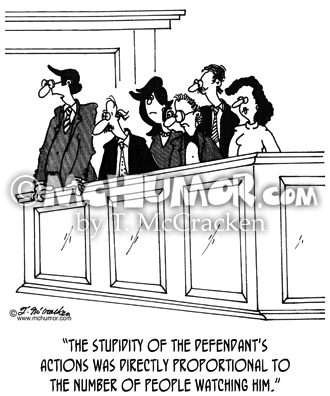 Jury Cartoon 5618: A jury foreman saying, "The stupidity of the defendant's actions was directly proportional to the number of people watching him." 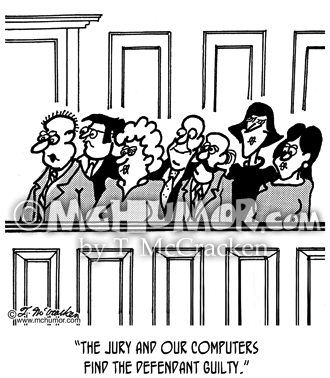 Jury Cartoon 2640: A juror saying, "The jury and our computers find the defendant guilty."